Think of summer cakes and the image of a table set for afternoon tea and loaded with seasonal food comes to mind. Taking pride of place on the table is a beautifully light sponge cake oozing with strawberries and cream. Alongside it is a plate covered with scones, waiting to be halved and spread with luscious raspberry jam and clotted cream. On our table, as an alternative to the more traditional strawberry shortcake, we have peaches and hazelnuts nestling in a buttery crumbly shortcake. Preheat the oven to 220 degrees C, gas mark 7. Grease a baking sheet. Sieve the flour and salt into a bowl. Rub in the margarine until you have a breadcrumb-like mixture. Handle as lightly as possible. Stir in the sugar and make a well in the centre. Pour in half the milk. Using a knife start to bring the dough together. Using your hand, start to knead lightly as you add more milk until you have a soft dough. Turn out onto a floured board and roll out to a thickness of at least ¾”. 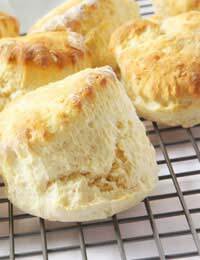 Cut out scones using a pastry cutter. Place onto the greased baking sheet and brush the tops with milk. Cook for about 12 to15 minutes or until well-risen and golden. Allow to cool and then eat as fresh as possible. Slice in half and spread with homemade raspberry jam and yellow clotted cream. Preheat the oven to 190 degrees C, gas mark 5. Grease and line 2 7” sponge tins. Sieve the flour and baking powder together. Place the margarine, sugar, flour and eggs in a food processor or mixer and whizz until light and creamy. Divide between the 2 tins and level slightly. Cook for about 15 to18 minutes until well-risen and springy to the touch. Turn out of the tins and allow to cool on a cooling tray. Meanwhile whip the cream until thick. When the sponges are cool, spread one layer with strawberry jam. Cover with the cream. Sprinkle with the strawberry slices. Place the other layer on top and dust with icing sugar. To make a more traditional sponge, first beat the margarine and sugar together until light and fluffy. Add the beaten eggs a little a time, beating well between each addition. Finally gently fold in the sieved flour. Omit the baking powder. Preheat the oven to 180 degrees C, gas mark 4. Grease a deep 9” tin. Mix the nuts with the brown sugar. Cream the butter and caster sugar together until light and fluffy. Add the eggs and flour and beat well. Peel and slice the peaches. Line the tin with a little less than half the shortcake mixture. Sprinkle over the sugar hazelnut mix and arrange the sliced peaches on top. Leave a little border round the edge. Sprinkle with the lemon juice and cinnamon. Put the rest of the shortcake mixture on top. Don’t worry if it’s not even: it will spread and blend. Cook for about 35 minutes until golden and firm to the touch. Serve in big slices with a generous dollop of thick cream.